Who makes the Cavalry's best ABL line-up? 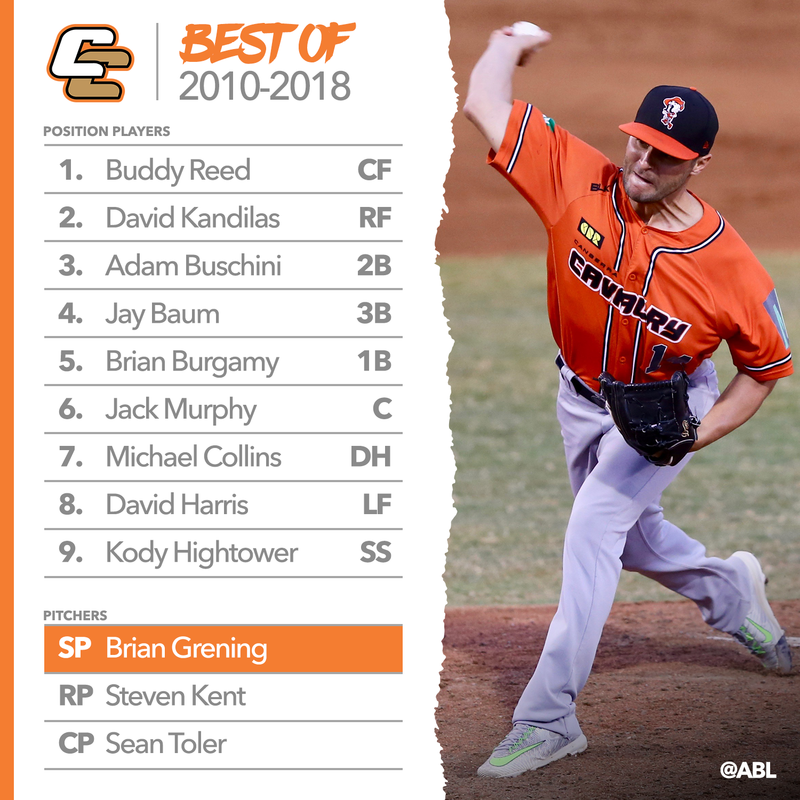 Some big names - Didi Gregorius and Kevin Kiermaier to name a couple - have donned Canberra Cavalry colours in the eight seasons of the Australian Baseball League. But did they do enough during their time here to make it into the Cavalry's best team? The team at theabl.com.au has combined their heads and come up with our best Canberra lineup. Just like with the Adelaide Bite and Brisbane Bandits it was far from an easy task, with many sleepless nights and skipped lunch breaks. Centre fielder Reed provided plenty of punch at the top of the Canberra order during the 2017/2018 season. The 22-year-old San Diego prospect hit .326 with 10 homers and 21 RBIs. He also legged out four triples, finishing with 91 total bases across just 31 appearances. He finished on a tear before returning with a fortnight left in the regular season, batting .373 with nine homers across his final 10 games. Kandilas enjoyed his best ABL season in 2017/2018, leading the league alongside Sydney's Chiang Chih-hsien with 44 runs batted in. All up, Kandilas finished with 12 home runs, 14 doubles and 110 total bases. His .380 batting average was a career high and ranked him fourth in the ABL on the season. During the playoffs he went 8-for-23 (.348) with a homer and five RBIs. The 2012/2013 Helms Award winner was a lock at second base after being one of the most damaging players to put on an orange Cavalry jersey. 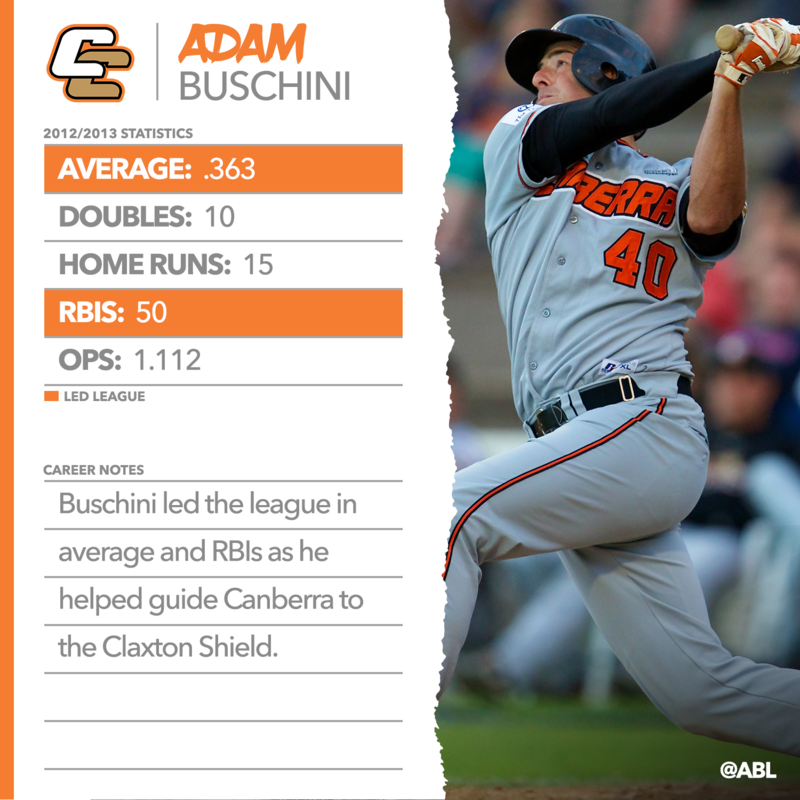 Buschini led the ABL with a .363 batting average, 15 homers and 50 runs batted in. He racked up 116 total bases, a mark only eclipsed once since. His OPS finished a staggering 1.112 across 42 games. Baum played a key role in the Cavalry's charge to last season's ABL Championship Series. He led the league with a .439 batting average, hitting nine home runs, 18 doubles and two triples along the way. Baum drove in 41 runs and racked up a 1.275 OPS. He failed to record a hit just four times in 34 appearances and had four four-hit games. Burgamy is another Cav to top the league at season's end for batting average. He hit .409 during the 2011/2012 campaign, finishing third for home runs (12) and fifth in RBIs (34). He also drew a league-high 34 walks, finishing with an OBP of .510. Burgamy was scintillating at home, averaging .456 with five homers and 14 RBIs in 23 games at Narrabundah. A fan favourite at Narrabundah, Murphy is also one of the most important players Canberra has ever had. He played a key role in their 2013 title run, hitting .304 with five homers and 24 runs batted in. Arguably his best season was in 2014/2015 when he led the ABL with 37 RBIs, batting .353 with 11 doubles and six home runs. All up he holds a career average of .295 in the ABL and has batted above .300 in three of his four seasons in the league. Now manager of Canberra, Collins was a joy to watch during the early years of the relaunched ABL. In the first season he was a standout for the Cavalry. He led the team with a .360 average and ranked third for runs batted in (17) despite playing just 28 games. Hightower is a .340 career hitter in the ABL, playing 77 regular-season games across two seasons. He hit .361 (third in the ABL) during the 2011/2012 season, homering six times and driving in 25 runs. A season later he hit .325 as the Cavs claimed the Claxton Shield. 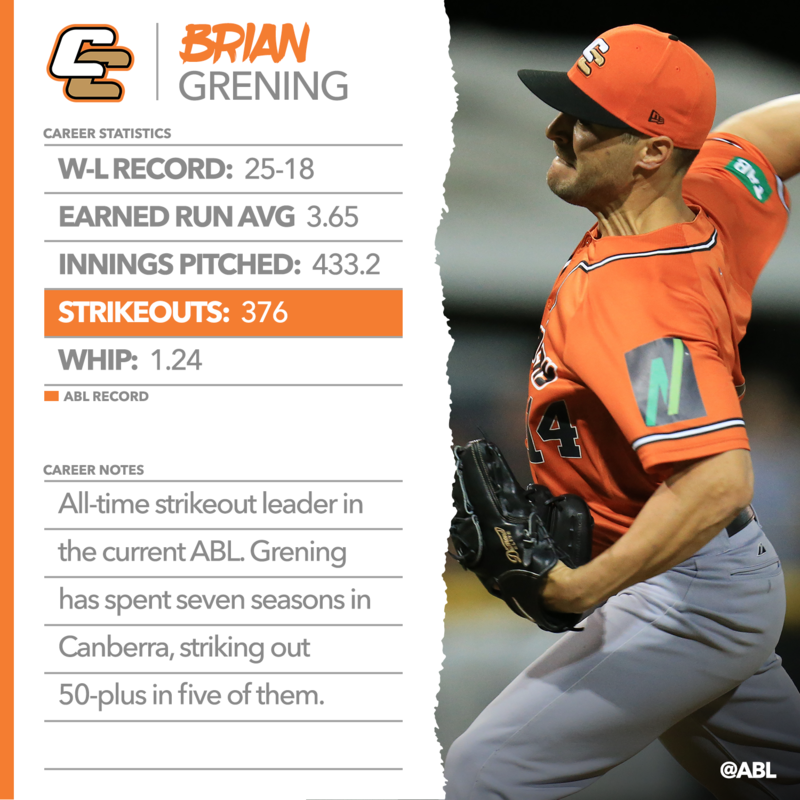 Grening retired from baseball after the most recent season as the all-time strikeout leader in the ABL. All up he punched out 376 hitters and helped guide the Cavs to the 2013 championship. He finished with an ERA below 4.00 in five of his seven ABL seasons, setting a career-best 2.87 ERA in 2012/2013. He struck out more than 50 hitters in five seasons. A veteran of seven ABL seasons with Canberra, Kent remains one of the league's best pitchers whether as a starter or out of the bullpen. He spent the past season in the rotation but had huge success as a reliever in previous seasons. In 2012/2013 he compiled a 2.45 ERA in 17 appearances, while in 2016/2017 he finished with a 2.08 ERA and restricted opposition hitters to a .194 average. Toler collected 22 saves on 25 attempts in his Cavalry career and was particularly effective in his first two campaigns. In 2012/2013 he held a 2.84 ERA, recording 11 saves from 11 opportunities while striking out 32. A season later he went 11-for-14 in save situations with a 2.92 ERA. How did we go? Who would you have in your best Canberra Cavalry team? Comment below! Stay tuned for the Best of Melbourne Aces next Friday.